English Needles No Longer Made In England. You will notice that embroidery needles are now available for purchase. Following lengthy discussions on the best type of needle to use for needle painting embroidery in my classes I decided to do some test runs. I normally use a crewel/embroidery No 10 for 1 strand and a No 9 for 2 strands – these have worked well for many years, but I have more recently taken to using a Sharps needle size 11 and am really enjoying it! The sharps has a thinner, shorter shaft and smaller but rounded eye which makes it easier to work the stabbing motion needed for needle painting, plus the smaller eye seems to glide through the fabric and thread easier. 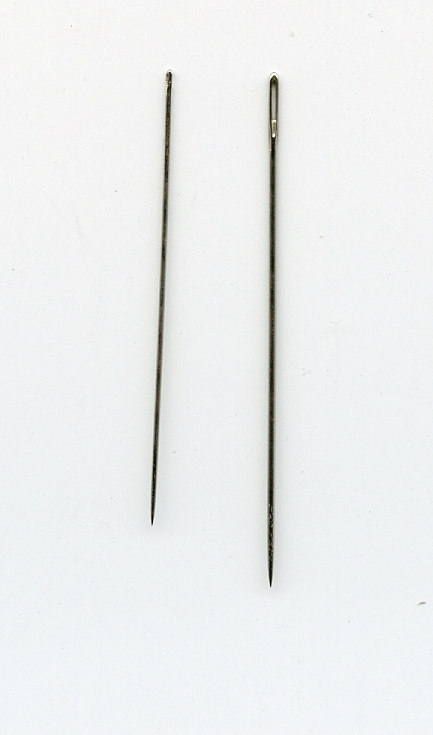 Below is a picture of both – notice the long eye on the crewel needle (right) and the small rounded eye on the sharps needle (left). As you will see the sharps needle is slightly shorter than the crewel. Packets of Richard Hemming English sharps No 11 needles are now available for sale, these are ideal for 1 strand of embroidery which is what I mostly use in my projects. The current kits include the crewel/embroidery needles but new stocks will now include the sharps needles instead. I hesitate to say “English” needles as apparently the manufacturers are no longer producing needles in England and of course like everything else, more recently these are being manufactured in China and then exported to the USA etc. But the current manufacturers have purchased the English machinery and equipment, so the production process is still the same and therefore the quality should also remain so. Only difference is that “English” needles are no longer manufacturered in England! 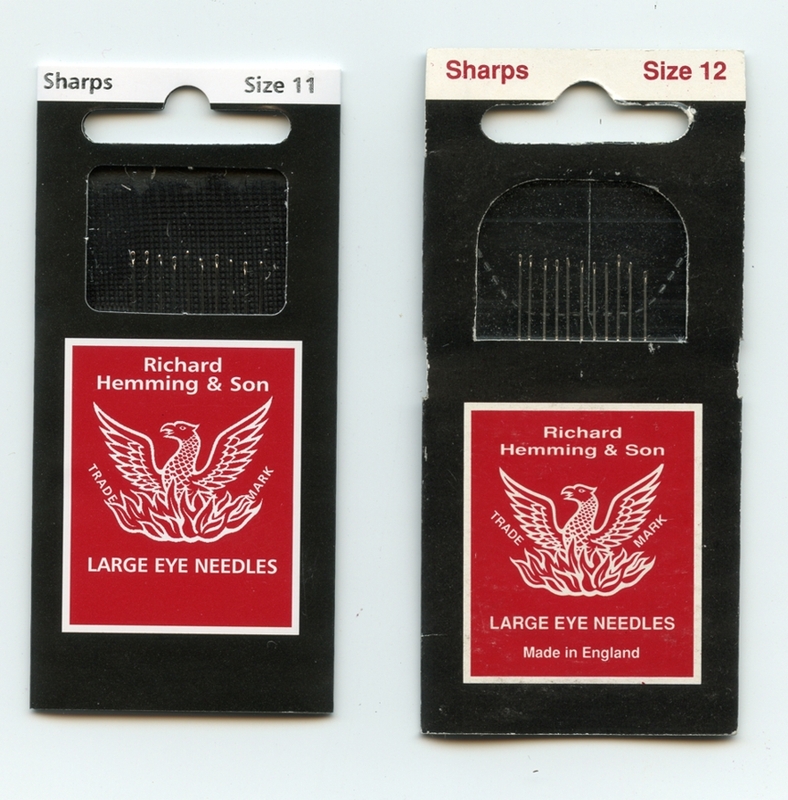 Below is an example: The packet on the right purchased about a year ago were the original Richard Hemming needles Made In England (notice the Made In England at the bottom of the pack). The packet on the left are the new needles purchased recently (no Made In England on the pack). Feel the tip of the needle with your finger – if it feels rough (still has burrs on it) then it has not been scoured which means it will catch when passing through the fabric. The thread should pass easily through the eye, if it does not then the eye has probably not been scoured properly. Needles are manufactured using a process where the waste metal around the eye and point is removed and scoured to remove burrs. If your needle snaps when in use or does not easily glide through the fabric there is every possibility that you have purchased a cheap alternative to the ” made in England” needle. (which is no longer made in England!) Good quality needles are hardened and tempered to remove brittleness and finally nickle plated and polished so that they glide easily through the fabric. . I should mention that because the Sharps needles are so fine they will bend a little with use – but should not snap. You will need to replace your needle once or twice or possibly more often depending on the size of your project. So the big question is: DOES THE NEEDLE YOU USE REALLY MAKE A DIFFERENCE TO YOUR EMBROIDERY? The answer is a resounding YES ! 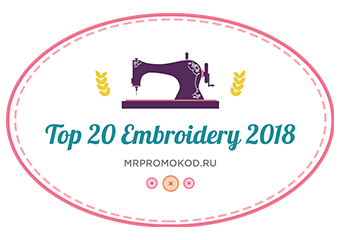 The right needle will glide through the fabric and threads easily without having to use a pair or pliers, even when the stitching gets quite thick. The right needle will make your stitching flow, blend better and provide a smoother transition of stitches. The two brands of needles I prefer at present are S.Thomas & Sons or Richard Hemming and these should be available from any good needlework outlet. If you have anything to add or needle tips would love to hear from you. So what would be the next alternative. Help. For hand quilting try Jean Lyle needles… they are just wonderful! Super smooth and very strong. These would also be appropriate for the needle painting as well I would imagine. Her website is sort of out of date but the needles are the best hand quilting needles I have ever used by far! It just occurred to me that just because the MACHINES are the same, that does not mean that the quality will remain the same. The chinese could use a diferent (cheaper)quality of materials to make the needles, meaning they will be not be the same. Hello, I am from California. What I have noticed about many made in England needles is they tend to have little burrs on them which makes them unsuitable for rayon and silk thread. I thought perhaps I had purchased a bad set of needles. In the past, I have always bought English needles because they were the best. Now I understand why I am having problems with the so called “made in England” needles. Thank you for the information. I will be careful in the future. By the way, who do we complain to about the direction of quality needles? I have heard they aren’t any more. Also in our sewing group we have noticed they have become more brittle. I am pretty sure that John James Needles in Redditch still manufacture all their needles in their own factory in the UK, as they have done for many years, and I know from past experience that they are beautiful. Unfortunately not. Some I believe still are, but some including the pebble have it on the back that they are imported to Entaco’s standard. It also very upsetting that Entaco aren’t replying to people email regarding the origin of their needles. I live in England and you absolutely cannot buy the Richard hemmings needles here, which is a shame, as I agree they are the best, but, hedgehoghandworks.com in California stock them, I ordered some recently and they came quicker than a book I had ordered from a retailer in the uk on the same day! I had heard about issues with not-really-English-made-English-needles. Thank you for providing some more detail. I definitely think that needles make a big difference. I’ve recently been using Bohins and really, really like them. I primarily use crewel 10s or small chenilles and the Bohin needles seem to glide effortlessly through fabric. I didn’t know that a needle could make such a difference until I tried a Bohin. They truly enhance my stitching experience. Thank you Trish for the information. This is great info. Can you tell me where to get the Japanese needles with the oiled felt please? Thankyou for a great blog entry…. Thanks Trish. I didn’t know this and it’s good information. I use Jean Lysle needles and I like them, too. Ever heard of them? I hope you have a wonderful weekend and happy stitching, too.